We’d love your help. Let us know what’s wrong with this preview of Wrecker by Noel O'Reilly. Mary Blight, stuck in a remote Cornish fishing village where ships are often wrecked on the rugged coast, longs for a life beyond Porthmorvoren. Picking among the corpses of the most recent washed-up dead, she spots a fine pair of leather boots on a dead noblewoman and unlaces them for herself. Only once she has removed the boots does she notice the woman’s earlobes are missing too. And by then it is too late. Village scold Aunt Madgie has seen her, bending over the corpse, blood on her lips. The horror of the bitten noblewoman makes the national press. That the villagers are such savages to bite jewellery off a corpse their hands too cold to unfasten it causes a national outcry. The Porthmorvoren Cannibal is the stuff of nightmares. And still Aunt Madgie watches Mary, knowingly, waiting for her moment. When Mary rescues a man who is washed ashore, lashed to a barrel, she cares for him in her cottage, despite her neighbours’ disapproval. Mary already has a bad name among those in the village, a situation not helped by her recent dalliance with the betrothed of her rival, Loveday Skewes. To ask other readers questions about Wrecker, please sign up. A story that takes you back in time to the days of the smugglers in our coastal towns. The town where I live was no exception to the days of poverty when ships where lured into danger for the valuable cargos that they possibly carried. We lived in very different days back then where you had to rely on help from the parish you was born in. Poverty was rife and if you where caught smuggling you paid a very high price for the crimes that you had committed. This story is not set in my town but on the A story that takes you back in time to the days of the smugglers in our coastal towns. The town where I live was no exception to the days of poverty when ships where lured into danger for the valuable cargos that they possibly carried. We lived in very different days back then where you had to rely on help from the parish you was born in. Poverty was rife and if you where caught smuggling you paid a very high price for the crimes that you had committed. This story is not set in my town but on the coast of Cornwall in the town of Porthmorvoren a Cornish fishing village where wrecks often ran aground onto the rocks. One of the inhabitants of the village is Mary Blight who is searching the bodies of the dead that have been washed ashore. She is looking for any valuables that she might find and when searching one of the bodies she notices the expensive boots on the corpses body. How Mary longs for those boots to grace her own feet but it is a struggle to get the laced up boots off the body and when she gives an almighty tug the boot hits her in the face causing her lips to bleed. When Mary looks at the body she notices that her earlobes are missing but she notices too late because she has been seen by Aunt Madge the village snoop. With blood on her face and a body with missing ear lobes wrong assumptions are made and Mary is in fear of her life if Aunt Madge reveals what she believes is the truth. The horror of the story soon makes the press but it's not the only thing that Mary has to worry about. As chance has it Mary rescues a man from the sea who is tied to a log and is facing death in the oceans swell. It turns out that the man she rescues is a Methodist Minister who gives Mary the job of Sunday school teacher. Their is great resentment in the village and talk abounds but will this be the end for Mary. I really enjoyed listening to this audiobook and I loved the Cornish voice on the narration of this audiobook. It was a dark story of bygone days but one that will stay with me for a long time. I can't resist a trip into the dark and murky past of our forbears and Wrecker plunged me into the world of bygone coastal Corwall. This is a take of poverty stricken fishing folk who often struggle to put another pilchard on the table and whom desperation makes reckless. These villagers live in crude hovels with naught to their names but the hand me down pagan beliefs they have inherited. They eke out the meagre living they try to sustain with fishing and farming, by scavenging goods which have I can't resist a trip into the dark and murky past of our forbears and Wrecker plunged me into the world of bygone coastal Corwall. This is a take of poverty stricken fishing folk who often struggle to put another pilchard on the table and whom desperation makes reckless. These villagers live in crude hovels with naught to their names but the hand me down pagan beliefs they have inherited. They eke out the meagre living they try to sustain with fishing and farming, by scavenging goods which have been washed up from the many shipwrecks which occur in the area. like the time she goes to the beach to see what pickings she can find following a shipwreck and impulsively pulls a pair of expensive boots from the body of a dead woman whose body has already been mutilated by a previous wrecker, an act she is to come to regret. Like the time she gets very drunk at a village gathering and lifts her skirts to try and ensnare a man who is promised to someone else, alienating herself from her peers. Like the attachment she makes to a man she rescues from the sea Gideon Stone a married Methodist minister who, after his salvation at Mary's hands finds in himself a burning ambition to save the villagers of Porthmorven from their pagan superstitions and returns to build them a chapel where he can preach and save their souls. Mary is a character I rooted for, yet didn't wholly like, she is cunning with a mercenary streak but seems to lack the sharpness of wit required to fully make the most of her opportunities. She treats people badly and her motives are sometimes unclear but mostly driven by greed and understandable dissatisfaction with her lot. The book is a gripping historical story, with love at its core and secrets and superstition at its heart, yet it's as far removed from a regency romance as the characters are from the drawing rooms of polite society. The Cornish coast is one of my favourite haunts in the British Isles, with its rugged and beautiful coastline, spectacular scenery and remote villages, it is a fantastic setting for a book. Combine this with a dark and treacherous story and you've got me - hook, line and sinker! The story is narrated by Mary Blight and tells the tale of wreckers, who would watch the bodies of drowned sailors wash up on their shoreline, and due to the extreme poverty they endured, would think nothing of taking the The Cornish coast is one of my favourite haunts in the British Isles, with its rugged and beautiful coastline, spectacular scenery and remote villages, it is a fantastic setting for a book. Combine this with a dark and treacherous story and you've got me - hook, line and sinker! The story is narrated by Mary Blight and tells the tale of wreckers, who would watch the bodies of drowned sailors wash up on their shoreline, and due to the extreme poverty they endured, would think nothing of taking the sailors boots or clothing. They also know that with shipwrecks come treasure - barrels of liquor, exotic fruits, and perhaps if they were really lucky, a jewel or two. After a severe storm, Mary rescues Methodist minister Gideon Stone from the sea, and in direct conflict with what the rest of the villagers would like to happen, she nurses him until he is back to full-health. It soon becomes apparent that Stone wants to bring an end to the pagan beliefs and customs that the villagers live by, and sets out to build a chapel on the hill. As Mary and Gideon are drawn together, things become increasingly difficult when people become jealous and begin to plot against her. This is a thoroughly engaging read based on true events that used to take place centuries ago. There is certainly an air of authenticity to it and O'Reilly's writing is beautiful, it easily draws you in and has you invested in the characters and the outcome from very early on. There are many different layers to the tale and they all interact effortlessly creating one of the best reads of the year for me. If the overall premise interests you, then I urge you to give it a go! I cannot imagine anyone being disappointed by this book in any way. I also wanted to give a quick shout out to the cover art - it fits the story impeccably! Kudos to both the author and the illustrator. I really enjoyed this. It's an engaging story with an interesting exploration of religion, morality, love and small communities. I probably would have preferred a slightly different ending, but overall this was a great read. A gripping historical tale. Laced Cornwall and menace in equal measure. Loved it. Wrecker is a fantastic, atmospheric and quite dark piece of historical fiction that I really enjoyed. The author is very good at setting the scene and I really felt transported to the Cornwall of the past. Cornwall’s myths and legends as well as the local dialogue is cleverly interwoven into the story which further helped evoke 18th Century Cornwall for me. The author has clearly done his research and I found it fascinating to learn more about the history behind the book. Wrecking was quite an em Wrecker is a fantastic, atmospheric and quite dark piece of historical fiction that I really enjoyed. Wrecking was quite an emotional practice to read about, especially when the shipwreck caused death. The people who did it or who stole from the dead must have been desperate to do it as I don’t think it’s something I could have done. The descriptions of what Mary sees when she visits the ship wrecks makes for quite hard reading at times, especially when it involved children .I did find myself skipping the passages that described those scenes. I wasn’t entirely sure if I liked the main character Mary. On one hand I liked her don’t care attitude towards a lot of things and felt sorry for her for having to visit the ship wrecks in order to provide for her family. However she comes across as quite bitter about her position in life and vain as she cares a lot about her looks which meant I wasn’t able to warm to her. I found myself thinking she’d be a lot happier if she just accepted her position and her looks as a lot of people seem to like her. For a historical fiction novel this was surprisingly fast paced with lots of stuff happening that helped keep my interest. The story is quite unusual and I wanted to keep reading to learn more about the history of place and to find out how it would end. I’m always slightly dubious when a novel is described as being like Daphne Du Maurier as she’s one of my favourite authors, but I did feel that it was justified this time as the styles are similar. Such an atmospheric and moody tale of life, jealousy, poverty, love and survival in a small and remote coastal village in western Cornwall in the early 1800s. I would have liked a bit more 'wrecking' but otherwise I enjoyed this beautifully written novel. Review to follow shortly on For Winter Nights. Ci sono due diversi meriti che vanno assegnati prima di parlare del contenuto di questo romanzo: la capacità esordiente di Noel O’Reilly di creare una storia così equilibrata tra leggendario e romanzato e la genialità di Harper Collins di colorarne la copertina invitando chiunque ad avvicinarsi per apprezzarne estetica e contenuto. L’ambientazione cattura donando lo sfondo perfetto ad una storia che prende vita a seguito di un naufragio e alla ricerca affannata degli abitanti del villaggio di qua Ci sono due diversi meriti che vanno assegnati prima di parlare del contenuto di questo romanzo: la capacità esordiente di Noel O’Reilly di creare una storia così equilibrata tra leggendario e romanzato e la genialità di Harper Collins di colorarne la copertina invitando chiunque ad avvicinarsi per apprezzarne estetica e contenuto. L’ambientazione cattura donando lo sfondo perfetto ad una storia che prende vita a seguito di un naufragio e alla ricerca affannata degli abitanti del villaggio di qualcosa che possa essere utile nella povera sopravvivenza quotidiana, e che continua e si conclude con la difficoltà legata al cambiamento di persone che nascono e crescono divenendo un’unica cosa con il paesaggio che le circonda e le tradizioni ad esso legate. Mary Blight ci racconta la storia dei naufragi, dell’attesa di quei corpi senza vita e dell’estrema povertà che costringe gli abitanti del luogo a rubare tutto ciò che giunge a riva dalle navi affondate. Sono consapevoli che insieme ai corpi arrivano tesori, barili di liquore, frutta esotica, e forse, se sono davvero fortunati, un gioiello o due. Proprio nel naufragio di una fredda mattina Mary ruberà un paio di stivali e sarà vista dalla vecchia arpia del paese: sarà l’inizio della fine. Il salvataggio del reverendo metodista da parte di Mary Blight sarà il punto di partenza per un tentativo collettivo di cambiamento che toccherà però quasi unicamente la stessa Mary che capirà, anche attraverso le chiacchiere e i giudizi della gente, che quel posto così isolato e arretrato, non le garantirà mai un futuro. La voglia di evasione, l’attrazione nei confronti del reverendo (sposato) e i continui scontri con le persone agiate del villaggio, ma soprattutto il sospetto che sia stata Mary a commettere un’azione ripugnante, creerà situazioni dure, complicate e dense di dolore che permetteranno però a Mary di riflettere e giungere ad una finale e drammatica conclusione. Il reverendo Stone, da parte sua, proverà a convertire e portare la profondità della religione in queste anime rozze, ancora così legate alle superstizioni, e a modificare una vita fatta di vizio e disuguaglianza; coinvolgendo Mary in queste azioni, non sa che darà inizio a pettegolezzi che saranno la rovina di entrambi. L’autenticità e l’attenzione dell’autore nel creare questa storia è evidente e apprezzabile; Noel O’Reilly ci conduce nelle profonde viscere di credenze e atteggiamenti tipiche dell’epoca di inizio ‘800, regalandoci una trama energica e brillante alla ricerca della redenzione e delle difficoltà di sedimentazione del cambiamento. Il luogo in cui è ambientato il romanzo è tanto inospitale quanto i suoi abitanti; terrà e persone che si fondono in uno scudo contro cui si disintegrano i tentativi di portare novità e buonsenso. La scrittura e la prosa sono perfette, la trama è sublime e le pagine scorrono come un fiume in piena. Mary Blight finds a women’s body washed up on Porthmorvoren shore and takes something that doesn’t belong to her. Littered across the sand are fine clothes, sparkling jewels, tasty fruits and brilliant trinkets once possessed by a nearby wreckage’s wealthy passengers. They are now treasure for the poor villagers of Porthmorvoren to sell. What the villagers – and Mary herself – do not know is that peril came in on the tide with all of those treasures, peril that will in the months ahead draw the Mary Blight finds a women’s body washed up on Porthmorvoren shore and takes something that doesn’t belong to her. Littered across the sand are fine clothes, sparkling jewels, tasty fruits and brilliant trinkets once possessed by a nearby wreckage’s wealthy passengers. They are now treasure for the poor villagers of Porthmorvoren to sell. What the villagers – and Mary herself – do not know is that peril came in on the tide with all of those treasures, peril that will in the months ahead draw the gaze of the whole county to their small cove. When Mary sees a man drowning in the cove, she leaps into the sea to save him. A risk easily taken; a risk easily regretted. Mary takes him home despite a warning from her sister Tegan because she is entranced by the man and she is determined to nurse him back to health. Over the weeks that follow, Gideon Stone, as he is known, grows stronger and soon begins to change Porthmorvoren. Taking up the mantle of its old Methodist minister, he decides to finish building the chapel and bring light into the small village. As so many of the local women scrounge his attention, Mary sees an opportunity to slot herself into his life. After agreeing to be the villages’ new teacher, Mary and Gideon travel to Newlyn so she can start her lessons. But her life is about to change. And not for the better. Because suspicion and jealousy are brewing in the streets of Porthmorvoren and Mary is the one who will suffer. Mary is different from the other women in the village, they see her as a bit of an enigma. She wants something more than to settle down with a local man and be a good wife. She wants a future where she isn’t tied down and forced to do as tradition dictates. In Gideon she sees a future for herself that could be extraordinary, a life of freedom. Wrecker is suffused with atmosphere, emotion and an incredible detail that will tether you to its pages. Noel O’Reilly exquisitely encapsulates the brooding mystery of Cornwall’s dark past in his sumptuous prose. I grew up in Cornwall and for a whole day this book transported me back to its rugged beauty and rekindled that fascination and wonder about its history. 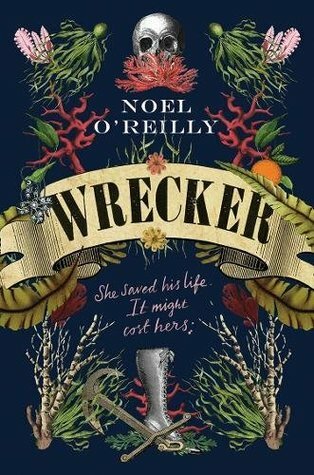 Brimming with unforgettable characters – especially heroine Mary Blight – and an atmosphere and detail that steals your breath away, Wrecker is a stunning tale of jealousy, revenge and love set against a backdrop where the only rival for its darkness and depth, is its beauty and mystery! Mary Blight is a memorable heroine. Strong and feisty she is as hot blooded as her hair is red. Eking out a living in the close-knit community of Porthmorvoren, she is as guilty of stealing from the dead of a wrecked vessel as the rest of the inhabitants. Vessels offered by the sea are accepted gratefully, no-one is ever turned over to the authorities and what takes place on the beach stays on the beach. But Mary dreams of escape, of leaving the narrow minded, superstitious village behind. When Mary Blight is a memorable heroine. Strong and feisty she is as hot blooded as her hair is red. Eking out a living in the close-knit community of Porthmorvoren, she is as guilty of stealing from the dead of a wrecked vessel as the rest of the inhabitants. Vessels offered by the sea are accepted gratefully, no-one is ever turned over to the authorities and what takes place on the beach stays on the beach. But Mary dreams of escape, of leaving the narrow minded, superstitious village behind. When she saves preacher Gideon Stone from the sea, she sees him as her saviour, regardless that he is a married man. Consumed with religious fervour, Gideon embarks on building a chapel for the village; driven by his own demons, he is desperate to save others from theirs. His desire to help Mary is seized upon by the women, their jealousy instigating a chain of events that can only have one ending. Wrecker is a great read. It evokes the Cornish landscape, the mystery of the age-old customs, the link between the people and the land and their endless struggle to survive. The characters are strong, some more likeable than others, but all believable. You feel yourself rooting for Mary, even though she is mightily flawed: she tries, she works hard and she strives for a better life. Yes, she lies, she thieves she snoops, but she has her own morality and sticks to it. Excellent. I received a copy of this book via NetGalley. This is a story about a remote, poverty stricken Cornish community in the 1800s, where superstitions and ghost stories are rife. Every now and then a ship wrecks in the dangerous waters of the cove and at these times the local folk rush out to claim the spoils of cargo, stripping ships to the bare bones and the dead of their possessions and even their clothing. Mary Blight is a spirited young women who raises a few eyebrows with her wild red hair and I received a copy of this book via NetGalley. This is a story about a remote, poverty stricken Cornish community in the 1800s, where superstitions and ghost stories are rife. Every now and then a ship wrecks in the dangerous waters of the cove and at these times the local folk rush out to claim the spoils of cargo, stripping ships to the bare bones and the dead of their possessions and even their clothing. Mary Blight is a spirited young women who raises a few eyebrows with her wild red hair and somewhat wanton ways. One day whilst down on the shore Mary spots a man tied to a barrel, floating out on the water. Without a second thought she rushes out into the swell and rescues the man from drowning. The saved man turns out to be a Minister who takes it upon himself to oversee the building of a chapel for the local people in an attempt to help them find God and do away with their superstitious, pagan beliefs. Even Mary tries to live a more pious life to gain the favour of the Minister, but her past sins threaten to come back and haunt her. This is a very atmospheric story about a community doing what it has done for generations in order to survive. I found Mary to be a very likeable character, a tart with a heart if you like, despite her sometimes questionable deeds and decisions. The writing is lovely and descriptive, though the religious elements were a bit much for me at times. Generally this is a very engrossing and enjoyable read. In a tiny Cornish village Mary Blight drags a man from the sea. The minister she saves leads her to far more trouble than he's worth. He's come to investigate the 'cannibal' who stole from the dead victims of recent wrecks. As the villagers turn on Mary and the minister provokes a religious fervour what will become of them. Not a bad book but not really for me, too long winded for not enough to happen. I will start by saying that there isn’t actually much wrecking in this book. It happens at the start and from there on out it doesn’t happen again. So, for those looking for an exploration of wrecking should probably look elsewhere. While this was slightly disappointing I persevered regardless because it was probably my fault for not reading the blurb properly. I wanted to give this book a fair chance and to see what it was about – if not wrecking. What it is about is a woman called Mary Blight, who gets caught up in the many changes in her small Cornish town when a Methodist minister Gideon Stone decides to rebuild the church and to start converting the ‘backwards’ people to the way of the lord. Yes, it’s all about religion. I would definitely say that the author did his biblical research, there’s scripture laced throughout and you get the sense of the religious leanings from the time. I can’t say whether this is a good description of Methodist faith at the time, but what I do know of that denomination seemed to be represented. I liked the way this book pushed at the was Christianity conflicted with local tradition, there are a lot of what might be called pagan rituals and superstitions in Mary’s town that don’t quite agree with the new minister’s teachings. Obviously, this process of ‘civilising’ was so much worse outside of Britain, but it is interesting to view it through the lens of this small town. What I did not enjoy was the way that Mary was written. A lot of her character could have been exactly what I enjoy. She had a lot of bite to her, she wasn’t willing to take nonsense from people, she did what she wanted and then dealt with the consequences as they came. But Mary’s only motivation seemed to be to find a wealthy man. That was pretty much it. You could argue that is more to do with the idea of bettering herself, of finding an easier life, of learning and changing and all those slightly better things. But it just reads as ‘everything I do will be in aid of getting a man and nothing else is really significant.’ Obviously, that could just be my reading of it, but I have come to expect a lot from female characters and Mary wasn’t quite enough for me. Since the book is totally focussed on Mary this made the entire thing fall a little flat for me. The other problem I had with this book is that not very much happens. I’m not expecting this to be full of action sequences and explosions or anything, but for the number of significant moments in the story, this book is quite long. I felt like that offset the pacing somewhat and made reading it quite slow. Again, that’s a matter of personal preference and if you prefer a slower burn then this may be the book for you. I can see a lot of people very much enjoying this story, however, I found it a little too slow and a little too religiously heavy for my liking. I would have also liked a little more character development for Mary. Mary Blight is a Wrecker; a scavenger who picks over the detritus washed up onto her Cornish beach. When she rescues a half dead man strapped to a barrel and it turns out to be the local minister, Mary strikes up a friendship with him and thinks her troubles are over. Nothing could be further from the truth. I have to say, it does frustrate me when there is a quote from a "celebrity reviewer" splashed across the front of the novel which clearly indicatest that that person has not been anywhere ne Mary Blight is a Wrecker; a scavenger who picks over the detritus washed up onto her Cornish beach. When she rescues a half dead man strapped to a barrel and it turns out to be the local minister, Mary strikes up a friendship with him and thinks her troubles are over. Nothing could be further from the truth. I have to say, it does frustrate me when there is a quote from a "celebrity reviewer" splashed across the front of the novel which clearly indicatest that that person has not been anywhere near the book itself. Essie Fox seems ot think that this novel has "Echoes of Daphne du Maurier" and, whilst I suppose it is true to say that this novel is also set in Cornwall, I cannot imagine how appalled Ms du Maurier might rightfully be to have her work compared to the story here. This is a generally unpleasant story all round. Mary Blight is a really unlikeable character with no redeeming features, as are all her neighbours. The setting is supposed to be dark and evocative but is actually just negative and miserable and, as for the story, there just really isn't any. If there is one redeeming feature, it is that the hardback cover is beautifully drawn and promised much which is not delivered. I found this novel really hard going and I am afraid it is not one that I would recommend. Shipwrecks are a part of life on the coast of Cornwall. In the remote village of Porthmorvoren, things are no different. Bounty and corpses wash up on the beaches regularly, and the locals take what they can. On one such day, Mary Blight helps herself to a fine pair of boots from the body of a dead noblewoman, not realising that she has set herself up as the prime suspect for biting off the woman’s earlobes to steal her earrings. As word spreads of the so-called ‘Porthmorvoren Cannibal’, Mary’s Shipwrecks are a part of life on the coast of Cornwall. In the remote village of Porthmorvoren, things are no different. Bounty and corpses wash up on the beaches regularly, and the locals take what they can. On one such day, Mary Blight helps herself to a fine pair of boots from the body of a dead noblewoman, not realising that she has set herself up as the prime suspect for biting off the woman’s earlobes to steal her earrings. As word spreads of the so-called ‘Porthmorvoren Cannibal’, Mary’s safety becomes less and less certain. The arrival of a handsome Methodist minister to the village only makes matters worse. Wrecker is the perfect book for fans of Poldark. The story itself isn’t particularly exciting. It’s a detailed snapshot of a time in Mary’s life where some unfortunate things happen to her, but nothing overly dramatic. There is no big adventure, no gruesome murder to solve, no epic romance. Just some interesting stuff happening to a pretty unlucky woman. The quality of the writing is what brings this story up. I didn’t like the characters very much – especially Mary – but I still found myself caring about her. To be honest, she deserved a lot of the bad things that happened to her, but I was rooting for her nonetheless. My main takeaway from this book was that I felt really, really sorry for Johnenry. My favourite thing about Wrecker was that it is written using old Cornish dialect (which is much easier to understand if you have watched Poldark). The character voices were so realistic and so full of attitude that, even though I found the story a teeny bit boring, it was a pleasure to read. The wild and windswept Cornish coast with its rich history of ship wrecks comes alive in this story of village secrets and ancient superstition. Like all the villagers in the remote Cornish village of Porthmorvoren whenever there is a ship wreck, Mary Blight heads to the beach to see what she can salvage, sometimes it’s a trinket or two, or occasionally, something more serviceable like a pair of wearable boots. When she discovers a distressed man in the sea, Mary risks everything to rescue him an The wild and windswept Cornish coast with its rich history of ship wrecks comes alive in this story of village secrets and ancient superstition. Like all the villagers in the remote Cornish village of Porthmorvoren whenever there is a ship wreck, Mary Blight heads to the beach to see what she can salvage, sometimes it’s a trinket or two, or occasionally, something more serviceable like a pair of wearable boots. When she discovers a distressed man in the sea, Mary risks everything to rescue him and nurses him back to health, but the villagers soon start to gossip about Mary’s motives for helping this stranger. The rescued man is Gideon Stone, an evangelical Methodist minister, who, on regaining his strength, sets out to bring salvation to this remote village which is blighted by religious fervour and age old superstitions. Wrecker is something of a slow burner of a story which I think is quite deliberate as it allows the place and its people to feature in a very realistic sort of way. The harsh realities of eking out a meagre existence in this unforgiving landscape are well described, as is the way that petty differences and scurrilous gossip are allowed to wreck and ruin lives. With a strong sense of time and place Wrecker comes beautifully to life, bringing together a strong story which is filled with a sense of destiny and which captures perfectly the spirit of this harsh and unforgiving time. My thanks to Lovereading.co.uk for my review copy of this book. Questo romanzo mi ha sorpresa in positivo sin dalle prime pagine, tutto mi aspettavo fuorché un romanzo divertente, ironico, ma anche profondo e spirituale. Mary è una donna forte che ne ha passate tante e che ancora non ha finito di lottare per la sua vita, per molti aspetti è una donna con uno spirito che anticipa i tempi: è ironica, sfacciata, stoica e non si lascia (quasi) mai sconfiggere dalle maldicenze; però è anche una donna del XIX secolo, molto superstiziosa e anche un po’ vanitosa. Alla fine, il giudizio degli altri pesa per tutti noi. Eppure, in qualche modo, riesce sempre a fregarsene e fare quello che le passa per la testa. Con l’arrivo del ministro, il suo animo si placa e cerca di dimostrargli quanto sia una donna devota e di fede, ma il suo destino è un mare in burrasca e neanche le preghiere saranno in grado di salvarla. Gideon, invece, è un uomo invasato, che cerca di nascondere dietro una fede ferrea tutti gli errori del suo passato e i demoni che abitano il suo cuore. È un ministro, ma è anche un uomo, capace di peccare. Se vi piace l'avventura, il mare, gli amori impossibili, gli uomini testardi e i personaggi femminili tosti, ironici, ma anche fragili, vale la pena di dare un'occasione a Relitto. Questo romanzo vi farà ridere, certo, ma soprattutto riflettere sulla natura dell’uomo, sulla superstizione e anche sulla fede. In più, le descrizione marine vi lasceranno senza fiato, così come il finale. I have a total thing for books set on the coast which are atmospheric and dark, I don't read them often but when I do I fall in love with it all over again. How ridiculously specific right? Well, Wrecker ticked those boxes for me and still managed to make me finish it in a handful of sittings. Following Mary Blight the story tells a tale of wreckers (people who take salvage from shipwrecks) and the minister who washes ashore and tr I received a copy of this book in exchange for an honest review. Following Mary Blight the story tells a tale of wreckers (people who take salvage from shipwrecks) and the minister who washes ashore and tries to turn the village-people towards God, as opposed to their old pagan ways. This is a story I've met a few times but with the story focussing on Mary and Gideon (the minister) I found it had a new depth I hadn't necessarily seen before. The village-people are truly trying to convert, however events lead them to show their old ways once more. It kept me fascinated and there isn't too much religion in the book, which I find can slow the book down. There's a good cast of characters, and not all of them conform to their stereotypes. Mary is not a typical woman who wants to marry and have children, and Gideon isn't all he seems as a minister. It makes everything more real when the leading characters have flaws that aren't just there to carry a plot line. They make a great lead duo and the surrounding characters also add to the story, Mary's lover, jealous villagers and Mary's sister all play a part in the events that unfold. This review has been hidden because it contains spoilers. To view it, click here. A story that takes you back in time to the days smugglers in our coastal towns in the UK. This story is set in the coastal town of Porthmorvoren in Cornwall. A Cornish fishing village where wrecks often ran into the rocks. The main character Mary Blight is poor and struggling so she searches the bodies of the unfortunate people who end up washed up on the shore for things of value. Mary rescues a man from the sea who is tied to a log and nearly dies in the ocean. The man she rescues is a Minister A story that takes you back in time to the days smugglers in our coastal towns in the UK. Mary rescues a man from the sea who is tied to a log and nearly dies in the ocean. The man she rescues is a Minister who gives Mary the job of Sunday school teacher. I really enjoyed reading this book and learning about smugglers and Cornwall. I really love a period drama and this kind of reminded me of Poldark. It was a dark story of tougher times. Un romanzo ineccepibile dal punto di vista storico, capace di evocare perfettamente l'atmosfera della Cornovaglia del XIX secolo. Un'atmosfera pregna di moralità e superstizione, due grandi temi che s'inseriscono nel ben più vasto e complesso calderone della tematica religiosa e di quella femminista. Molto interessante anche Mary Blight, la protagonista, per la sua enigmaticità e la conseguente difficoltà che si ha nell'interpretarla. Da tempo non leggevo un libro che mi prendesse tanto. Un capolavoro è un ottimo libro per capire meglio la Cornovaglia del passato, descritta superbamente. Da leggere. Meh! Not as exciting as I thought. History parts were interesting though.